Paul Weller & Steve Cradock To Play DJ Sets In Doncaster! – Paul Weller News! Paul Weller & Steve Cradock To Play DJ Sets In Doncaster! 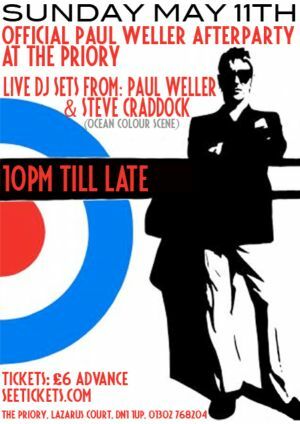 Paul Weller & Steve Cradock are scheduled to play DJ sets at an official after party in Doncaster on May 11, 2008 at The Priory. Tickets to be available at SEETICKETS. Not sure if this is confirmed as I’ve checked both sites and they have no listing for this event at the moment. I’ll keep an eye out for any further details and will update this spot as soon as I know more. Previous Entry Andy Crofts To Play With Paul Weller On Upcoming UK Spring Tour!